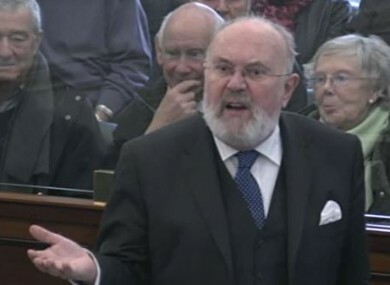 Norris, who is a longstanding resident of the area and champion of Georgian Dublin, told the Seanad he had witnessed “degradation and blight” during recent strolls in the neighbourhood. In the past week or two during a convalescence I have taken to walking around my area, which is the Georgian core of Dublin. What I have seen has absolutely horrified me. I have seen an area of dereliction and waste. I looked at the building Dublin County Council put up. It is an ignorant appalling building of mass concrete. …We have knickers shops and an amusement arcade. What kind of a street is this for a capital city of a European country in the 21st century? Norris suggested the government establish an authority to “put manners on” those responsible for the dereliction. Email “WATCH: David Norris condemns 'knickers shops and ignorant buildings' in Dublin city”. Feedback on “WATCH: David Norris condemns 'knickers shops and ignorant buildings' in Dublin city”.